I’ve been putting together a DCC Model Train controller (http://agmodelengineering.wordpress.com/2013/12/13/dcc-encoding/ and https://garygfletcher.wordpress.com/2012/04/16/dcc-model-railway-encoder/) for a while and we’re there! A nice box an LCD and to make the control of the model trains and their functions (lights, sound, steam etc) I added a BLE adaptor and developed an iPhone app to control it. This project would have been incredibly difficult if it wasn’t for the help of various members and it’s amazing the leverage, ideas and knowledge base we have at RLab. The specialist kit like the electronics bench, power supplied and scopes made this happen and it was super fun and great to have built almost an entire product at the space! 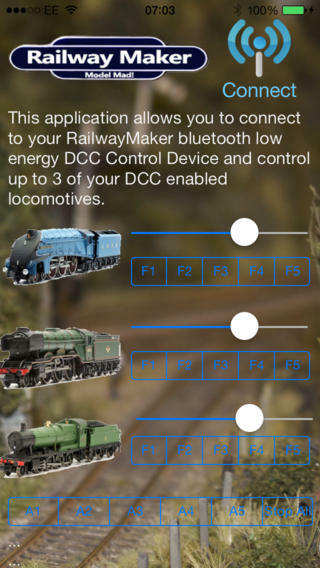 This entry was posted in iPhone & iPad Development, Micro Electronics, Model Railways.